Japanese airline All Nippon Airways (ANA) receives top award for LGBT friendliness in Japan. 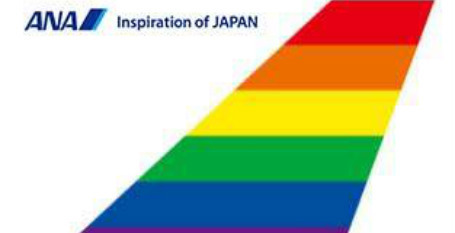 Japanese LGBT friendliness index Work with Pride has awarded All Nippon Airways (ANA) Group its Gold Award for its positive attitude towards LGBT equality. “We are very proud to announce that the ANA group was the first to receive the Gold Award” ANA group announced in a Facebook post on Tuesday. Work With Pride, a private organization with the support of IBM Japan and Human Rights Watch, released a Pride Index of LGBT-friendly workplaces in Japan in November last year. Of the 82 companies which applied, 53 were ranked as the highest level of LGBT equality, gold. Companies were rated based on five categories which spell out the word Pride: Policy, Representation, Inspiration, Development, and Engagement. Those awarded gold include Japan Airlines,Sony Group, Panasonic, Fujitsu, Microsoft Japan, Unilever Japan Holdings, and Rakuten. “ANA Group is proud to continue to provide a friendly environment for all of our LGBT customers and staff. ANA are committed to help fight for equal rights for all of the LGBT community,” the airline said in its Tuesday statement. I am pleased that this air carrier has chozen to have complete to all it's customers. I certainly will fly with them when I need a flight that they provide. 5 starts to them . Go for it! If that is really what you want!